G6 Designs has always thrived on helping other businesses and companies make it on the World Wide Web, we enjoy what we do which means we put our all into getting you the best results possible and we aim for 100% customer satisfaction. So if you would like a beautiful, fresh looking and results driven website then you are at the right place, our testimonials speak volumes. Any web service you require we can offer whether it be Web Design Services, Ecommerce Services, Website Hosting, Social Media Integration, Managing Your Website or Branding Services we have got you covered. G6 Designs can design and develop a website for you, or if you have a design in mind we will develop that exact design for you. As well as all the services you could want we also offer free honest advice and our prices cannot be be beaten for the service you will receive. Contact us for more information or free honest advice. 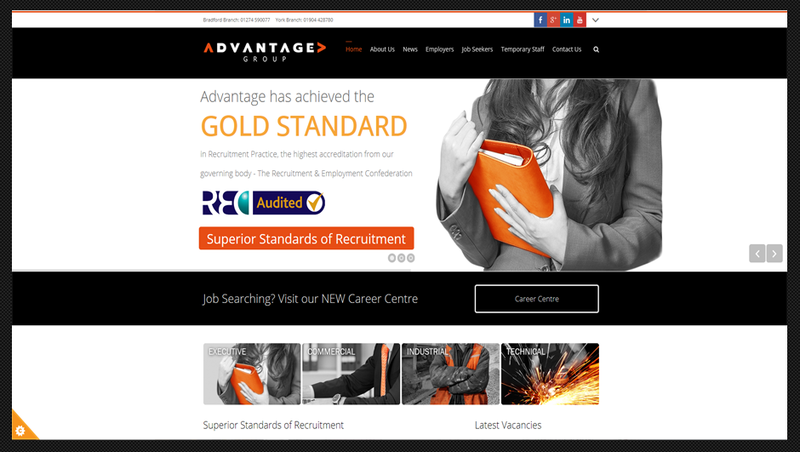 We were approached by Advantage Group to give their website a makeover as their website was running Flash which does not appear on mobile phones and tablets so they wanted all Flash removing from their website. They also wanted there logo altering which meant we had to rebuild the logo from the ground up, plus one of the most important things they wanted was to have a job board built and installed, so their customers could submit their C.V's online and apply for specific jobs. As well as the job board being fully functional to Advantage Group customers it had to be functional to their staff too, so we ensured the job board could be managed by any chosen staff member, plus it was all categorised into location, job type, wage and more so these credentials can be refined in a customers search.